1. In a stand mixer, using paddle attachment, combine butter and sugar. Whip approximately 2 minutes. Scrape down sides of bowl. In a separate bowl, beat eggs with vanilla. Add beaten egg/vanilla mixture to butter/sugar mixture. Beat until combined. Slowly add flour. 2. Melt chocolate. Add to ½ of the cookie dough, and mix well until incorporated. 3. 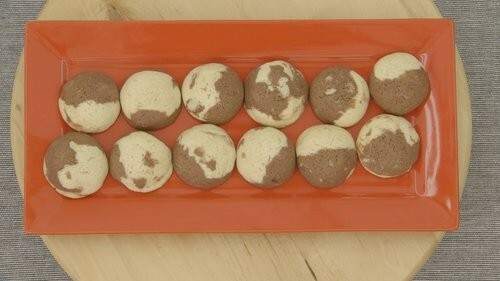 Pinching a piece of vanilla dough, and a piece of chocolate dough, form dough into balls approximately 1 ½” in diameter. 4. Place on cookie sheet lined with Silpat liner approximately 2 “ apart. Bake at 3500 for 14-16 minutes, until very lightly golden on bottoms. 1. Combine flour and baking powder; set aside. In a stand mixer with paddle attachment, cream together butter and sugar until light and fluffy – approximately 3 minutes. Add egg and vanilla, beat another minute. Slowly add flour mixture. Once combined, form a ball, and refrigerate 30 minutes. 2. Roll dough out to ¼ inch thick. Cut out circles 1 ½ in diameter. Bake at 3500 8-10 minutes. Cool on cooling rack. peaks form. Tint ¼ red; tint remainder white. 4. 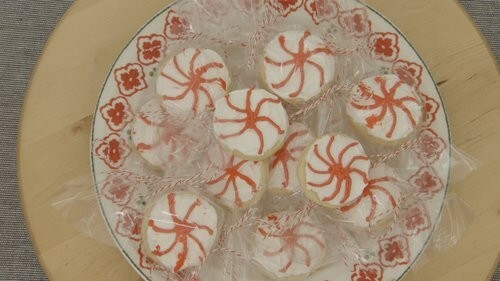 Ice cookies to resemble peppermint starlight candies. Place in cellophane bags, tie ends with twine, then trim and fan out so cookies resemble wrapped candy.